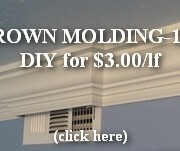 Simple updates to our molding makeover that don’t need to be linked to a pillar page. 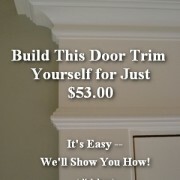 How to Make PILASTER-104 for About $13.61 ea. Traditional Style Finish Carpenter Price c. $9.00/lf + $10.00/Corner or Return A Doric baseboard straight from Andrea Palladio’s First Book of Architecture. You can use this powerful baseboard to serve as the foundation of your traditional style home’s architectural treatments…. DIY Wainscoting on Brick Wall Update. Take a Look! [This is part of Our Kitchen Molding Makeover series.] We’ve finished installing our homemade, mdf wainscoting on the kitchen brick wall. Our molding choices were based on Andre Palladio’s interpretation of the Doric architectural order.